In a “dog-eat-dog” world, small law firm marketing can be ruthlessly competitive due to campaigns being complicated, high in quantity and having expensive keywords. 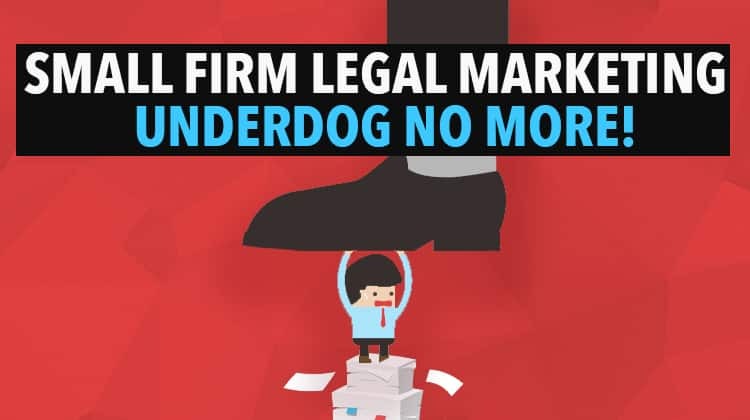 So how can the “underdog” of a small law firm possibly make their way into the digital marketing fight? In the legal industry, being ranked #1 is believed to be the lawyer best for that area of law. Many will fight to secure that spot based on that assumption and it can be competitive in that space. If you are a solo or small law firm, there are ways you can overcome some of the obstacles you feel. Below we will talk about how you can make the “underdog” mentality work in your favor to stand out, grow and stabilize your firm’s success! WHY: The purpose of your legal marketing plan. What are the definable goals? WHAT: What do you want to accomplish? What are your long term and short term goals? HOW: How will you implement these plans? Do I need to outsource, hire or reconsider some things to help the goals become successful? On top of the basic questions, the power of tracking your results will be crucial to your legal marketing efforts! As most small law firm marketing budgets are not robust, why not spend your money on marketing plans you know will work? Don’t waste any money on marketing you cannot track, you want to know where your money is being spent and how its doing! Google Analytic demographics can help you measure meaningful variables like audience demographics, impressions, click through rates, cost per conversion and many other trends over a set of time. This information can be helpful as you start to formulate your legal marketing plans to see what works and what does not. Hook your blog and website —free of charge—to Google Analytics to see how your content is doing and who’s reading it. A premium version offers additional insight. For more information about this, see: Essential Website Metrics You Should Be Tracking. The firms that are the most successful are the ones that have focus on their targeted market. Do not spread your services too thin, set yourself as an expert in a specific field! Think about specifying your type of practice, by doing so, you can automatically set yourself apart by choosing one type of law to focus on. Generalizations make small law firm marketing hard and make you blend with the rest of the legal marketing pool. A perk to doing this in legal marketing advertisements is Google treats SEO the same way! Google rewards websites with higher rankings that are hyper-focused on a topic which can give you a leg up on getting your firm name out faster! Send content to be featured on blogs, news sites and other local pages that will help with locational and divorce related SEO. Your law firm’s online presence begins with your website. So much of the other components of marketing plan, like SEO, PPC and social media come back to your website and how effective it is. An easy to navigate website full of meaningful resources and content to help clients with legal needs. A Fast Website that creates a positive and easy experience for those who visit it. Test your website using Google Page Speed Insights. Make sure it gets a good rating! An intelligently designed landing page that will lead to more targeted calls or case evaluation requests. A mobile-friendly website and looks great on any device! Its 2018! An easily found contact page so people can schedule client meetings! A website that includes testimonials and social proof. People care about reviews and personal touches, that is why Amazon is so successful! People trust people! A personable website avoiding generic stock images of courthouses and gavels! Include personalized pictures of your firm, especially one that features your team! A search-engine-optimized website: Getting found starts with a website that is configured to be found by Google! One free way to help build your small law firm marketing presence is sharing your firm’s information on popular business directories like Yelp, FindLaw, Avvo, Yellow Pages and Angie’s List! By sharing your information it can be another avenue to bring new potential clients through your doors as well as creating other online traffic—free of charge! Information that would be important to share are: Firm name address, phone number, business hours, website, but most of all engaging descriptions and visuals. Each of these citations should be consistent in places where people might be looking for a lawyer. Potential clients deserve and expect consistency with your firm’s brand and experience. Make sure your quality is high, engaging and relevant throughout your platforms! There are a lot of lawyers…actually let me rephrase that…There are enough lawyers to sink a battleship ten times over! There are more attorneys then ever before, over 1.3 million in the U.S. alone, to be exact, according to the American Bar Association. Although this seems like a daunting mountain to climb with your small law firm marketing, you can stand out with your creative use of social media! To me, social media is the great equalizer in small law firm marketing. You might not have the man power, establishment, or money to compete with the bigger firms but you can build a name and relationships fast with social media, something a small law firm could never do before! Social media is a game-changer for small law firms. The power is in your hands to create content that will set you apart as thought leaders in your field. Quality content not only builds you a name and niche, but you will build relationships with the people who care about your content and practice topics! Many attorneys are reluctant to embrace social media because of state bar rules of solicitation but you can be creative and yet mindful of these restrictions with social media use! As law firms directly communicate with the communities they serve, social media becomes a natural way to reach people in need and acquire new clients. Know that most social media advertising is cheaper, effective and helps you create a sense of reliability! Utilize social strategies like Google Algorithms for SEO, Paid Social, video usage and hosting live events! All of those actions will help set you apart as a relatable, approachable and engaged firm that is wanting to be a resource to potential clients! As a lawyer, you understand how important it is to communicate and answer questions fully and strategically. This quality of words can often mean the difference between winning or losing a case, or finding the one detail that can help your client out. You are already really detail oriented and targeted in your messaging, writing and speaking—you can use these skills for creating visual and written content for your firm’s website and blog! Engaging and quality content is important for a small law firm marketing campaign because it affects search engine optimization (SEO) and visitor conversions. Law firms that write high-quality website and blog content hold a significant marketing advantage over their competitors. Visuals in particular can help round out your content to be relevant, creative and different. Developing a strong visual brand strategy, particularly in the social media world, is the key to setting yourself apart from your competitors and helping your firm grow. The details of your firm matter because they quickly distinguish between quality and amateur ones. A brand is an experience you create for a customer. It encompasses the visual, emotional, intellectual and tangible experience a customer has with your business. So, having consistent visual branding can create the experience clients can trust knowing you are stable in your firm’s business model. 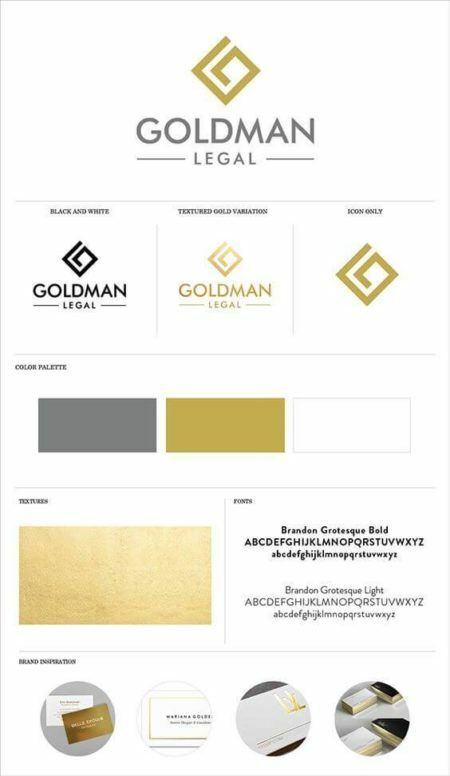 Above, Goldman Legal has set type, color and logos they can create their content around. This will be consistent across their website, business cards, emailing content, social media platforms as well as their blog! Excellent visuals for your legal marketing are something you should be implementing right away as they are the first touch point a customer will have with your business. First impressions matter. since clients are searching for established firms that look professional, high quality and trust worthy. Creating visuals that not only set up your brand experience but inform are important as well. Writing is crucial to your legal marketing but mixing up the content is helpful and creating informative visuals can help with interest, brand awareness as well as website traffic! 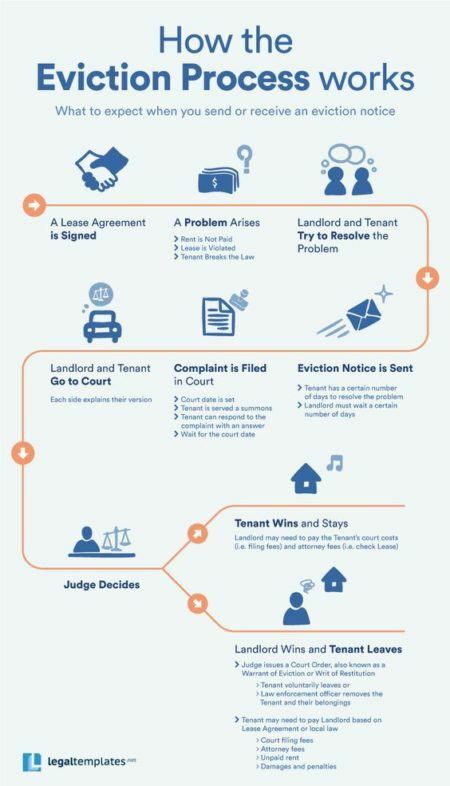 Thanks to them, potential clients can now have a visual “explainer” of how the eviction process works in some jurisdictions. See how something complex can be made visually simple and informative to potential clients? This can be a sharable resource that can easily be shared to a wide audience! Now we will talk about quality content in more detail in the next section! If you have a website, you should also have a blog. Add new content weekly, because Google algorithms reward sites that share relevant, consistent and original content. The content doesn’t have to be equivalent to your research papers and study. Blogging can be as simple as writing a paragraph or two sharing information about your practice, helpful hints, success stories or opinions on legal world chatter. Make sure you make the most out of your work by having “share” or “save” buttons at the end of your posts to enable your readers to immediately share on their social media pages. Why not get more exposure if you can? Divorce statistics in Utah County. Understanding Child Support Payments . Is there a legal way to make my ex take my name off of accounts? FAQ: Divorce Laws in Utah. What paperwork do I need to file for Divorce in Alpine Utah? What is the cost of filing divorce papers? Are you prepared for the financial stresses divorce may bring? What to expect on divorce court days. How can a divorce be handled to minimize the harm on the children? Offering meaningful resources in your legal marketing will bring more people to your website. And those people are more likely to need your services at some point, since they are already looking for resources on similar topics. Well, you can now run with the big dogs! Do not let the dog fight competition for successful legal marketing success stop you from feeling relevant! With the use of smart strategy tips like above, you can have a dog in the fight for stable and ongoing legal marketing success! What is in your underdog mentality? How can we help with your small law firm marketing strategy? Let us know in the comments below!